Park Regis Singapore offers well-furnished 4-star rooms with 42-inch flat-screen TVs, just 800 ft from Clarke Quay MRT Station. It features a fitness center, outdoor swimming pool and restaurant. Modern rooms at Regis Park Singapore have floor-to-ceiling windows that offer plenty of natural light. Each elegant room is equipped with ironing facilities and a safe. Bathrobes and slippers are also provided. Guests can get their daily work-outs at the fitness center or enjoy a dip in the swimming pool. Park Regis Singapore also provides a concierge service that sees to guests’ requests. The on-site restaurant serves a fine selection of local and international dishes. Other dining choices include light snacks and refreshing cocktails at the bar. 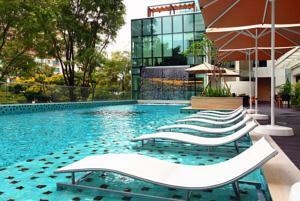 Park Regis Singapore is one mile from Boat Quay and a 25-minute drive from Changi International Airport. Free! Wired internet is available in the business center and is free of charge. Wired internet is available in the hotel rooms and charges apply. Free! All children under 2 years stay free of charge when using existing beds. There is extra beds/baby beds in a room is 0 capacity for extra beds/cots in the room.